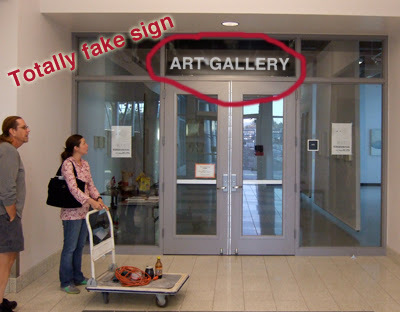 This is a totally fake photoshop sign labeling the new gallery. We've requested, begged and been promised an actual sign like the cool metal one on the Library. Let the countdown begin! Guess how long until the actual sign is installed and win some swell, yet to be determined, award from the Art department. And don't forget to take our poll on the right side of the page.